Boracay is one of the most beautiful islands in the Philippines (which is saying a lot since there are literally thousands of beautiful islands in the Philippines). 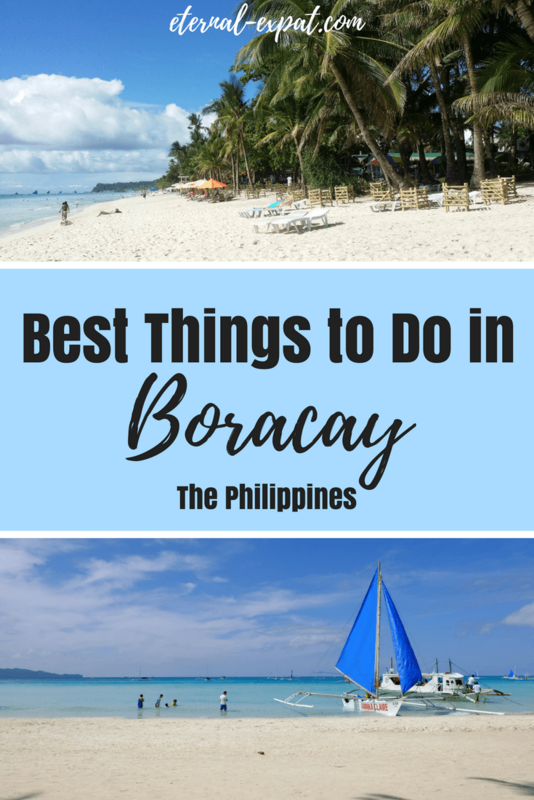 For such a small place, there are literally tons of things to do in Boracay. Whether you want to lay along the white sand beaches, go snorkeling, paddle a kayak, or do something a little bit more romantic, you’ll find plenty of activities to keep you busy for well over a week in Boracay. In addition to being one of the most stunning islands in the Philippines, Boracay is also one of the most visited islands in the Philippines. It’s a popular honeymoon destination because it’s so freaking beautiful and a lot people who enjoy package holidays to the Philippines end up on this little slice of paradise. That shouldn’t put you off though. Although the island is only 7km or just over 4 miles long and a narrow 1km or just over half a mile wide, there’s plenty of paradise to go around. 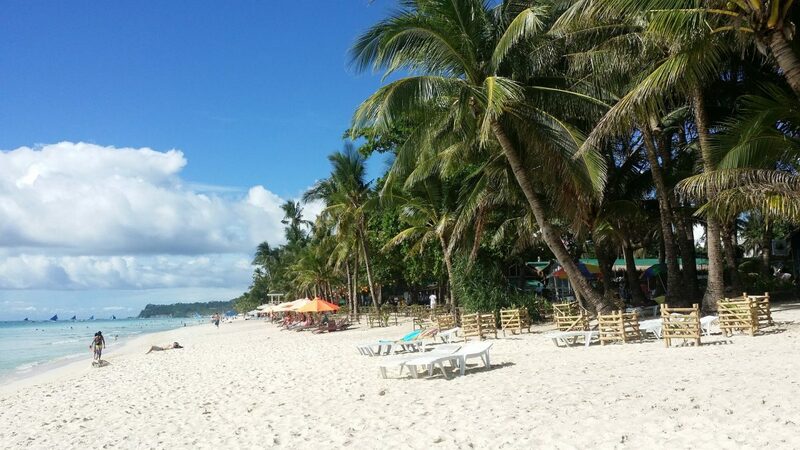 White Beach is the main beach in Boracay. It’s one of the most postcard-perfect beaches that I’ve ever seen. It is literally all cliche descriptions of white sand and turquoise waters. The beach is split into three areas, Station 1, Station 2, and Station 3. This is how restaurants and hotels tell you where along the beach they’re located. Station 1 is where you’ll find all of the high-end boutique hotels. If you want to feel like you’re staying in paradise without the huge bill at the end of the trip, head here along the beach and rent a chair, buy a few drinks and spend the day in Station 1 laying on a comfortable lounge bed. Station 2 is where you should head if you want to find all of the restaurants, cafes, and bars. This is where most of them are located. It’s also where the best nightlife is. 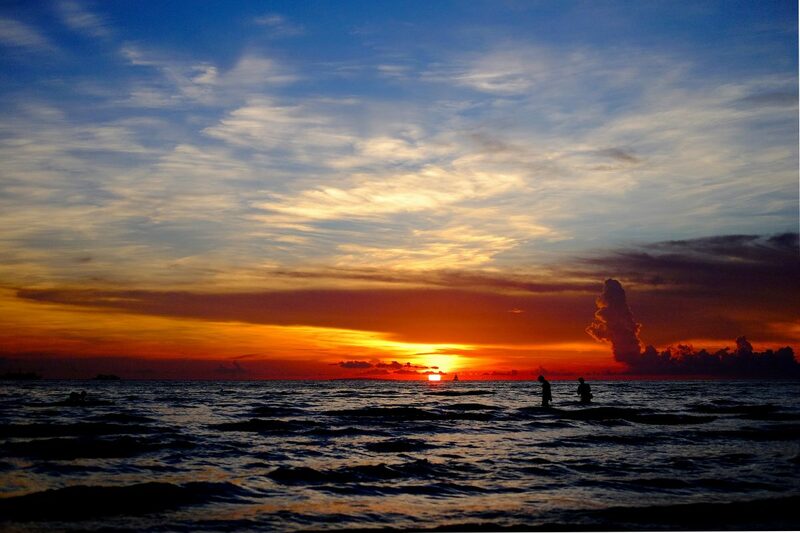 If you’re looking for the famous Boracay beach parties, this is where you’ll find them. Station 3 is the quietest area of the beach, so if you want to get away from the busy hotels and busy nightlife, head to this area of White Beach with a towel or sarong and chill out with a book and a beer (which you can buy from a shop in Station 2). If you’re looking for a bit of adventure while you’re visiting Boracay, head to Zipline Boracay. They have a few different activities like zorbing and there is a cable car you can ride, but the main attraction is definitely the zip line. It’s fun if you’re going with your significant other or friend. You can do a tandem zip line and race each other to the finish line. The zip line isn’t very long, so you can head here for the afternoon and try out a few of the different activities, or start your day with a little adrenaline on the zip line before heading to the beach in the afternoon. 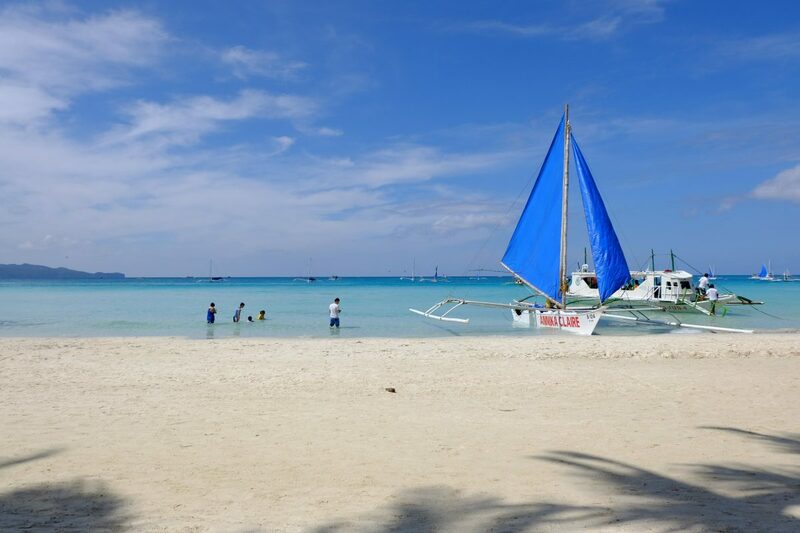 Another really fun and popular thing to do in Boracay is to go on a boat tour of the surrounding islands. Most boat tours last about five or six hours, so it’s definitely an all-day excursion. The most common islands that you’ll visit on your trip are Crystal Cove, Balinghai Beach, Magic Island, Crocodile Island, and Puka Beach. You get a huge buffet lunch as part of the tour fee as well as fresh fruit all day and plenty of water. They will stop at different locations where you can jump into the water and swim or go snorkeling or you can just lay out on the boat’s deck and get your tan on. To book one of these tours, head to any booking agent in Boracay or look for the guys with the flyers when you’re walking around the village. 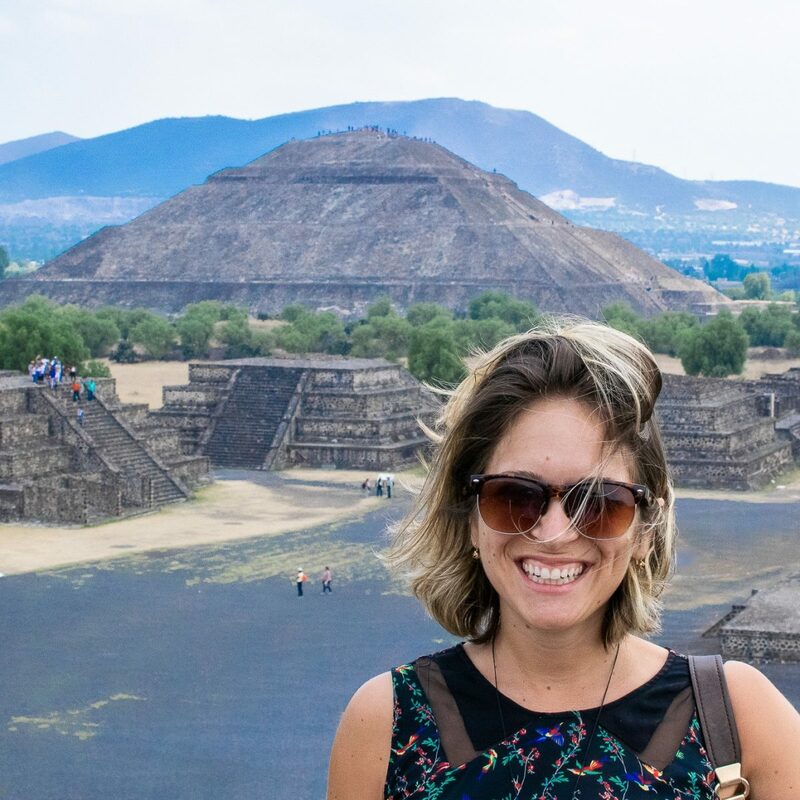 Many hotels and hostels will help you book this tour, too. 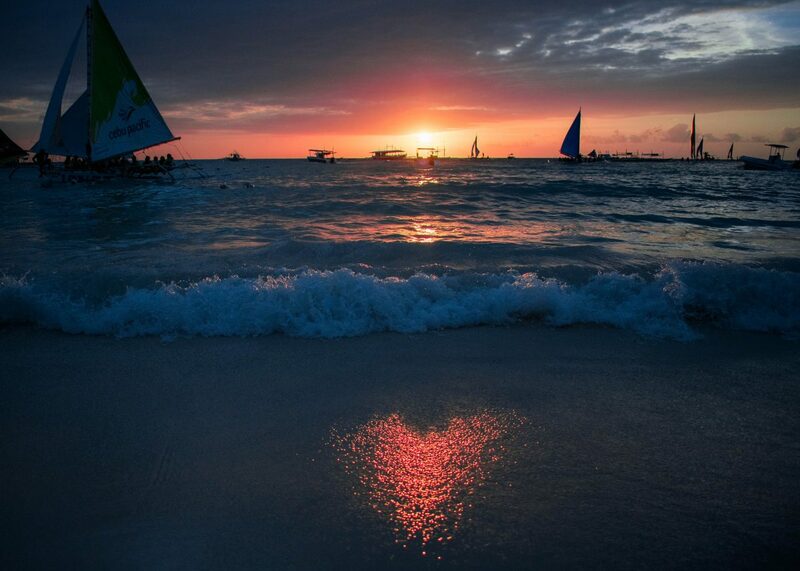 If the main attraction of Boracay is the white sand beaches, the second biggest reason to visit is the nightlife. Almost every night of the week you can find a different pub crawl happening, but the best one is the official Boracay Pub Crawl. It’s a great way to meet fellow travelers if you’re traveling solo or you just want to make some new friends. While most people are young backpackers, there are still plenty of different ages and budgets on the tours each night. The Boracay Pub Crawl takes you to five different pubs, includes a t-shirt or tank top, and plenty of free shots. Be sure you eat before you go on the tour, otherwise, you’ll be suffering for it heavily in the morning. A tour of the bat caves is a great way to get out and explore more of the island. To get to the caves, most tours will have you hike along a jungle path. The cave was carved out of the rocks several hundred years ago and has since become a haven for bats on the island. There are what looks like thousands of bats clinging to all sides of the cave. If you don’t want to hike, you can also look for tours that take you there by boat. It skips out on the jungle trek and takes you straight to the mouth of the cave by speedboat. Obviously, these tours are slightly more expensive. I love spending the afternoon at the beach and finishing up the day with a massage. There are tons of different places on the island to get a really reasonably priced massage. A lot of the hotels and resorts have their own spas, so be sure to ask at the front desk about what sort of deals you can get on spa packages. If you’re looking for a great place to get a massage or other spa treatment while you’re on the island, you can’t go wrong with Tirta Spa. They have unique massage options like hot puka shell massages or hot lava stone massages. They also have packages where you can spend the whole day pampering yourself without dropping a ton of cash. One of my favorite things to do when I visit a new country is to take a cooking class. Whether you’re a frequent visitor to the Philippines or it’s your first trip to the country, taking a cooking class is a great way to sample different foods and also learn about the history of these customs. There are several different options around the island, but most offer the same thing. You meet early in the morning and go to the market with the chef and rest of the tour group. You’ll learn about the different fruits and vegetables that are common in Filipino cooking and get to see where the locals shop. Then you’ll go to a kitchen where you’ll learn to cook at appetizer, two main courses, and a dessert. Then you get to eat what you’ve cooked! Most of the classes will send you away with a printed copy of all of the recipes to take home with you. Check out my other Posts about the Philippines here.